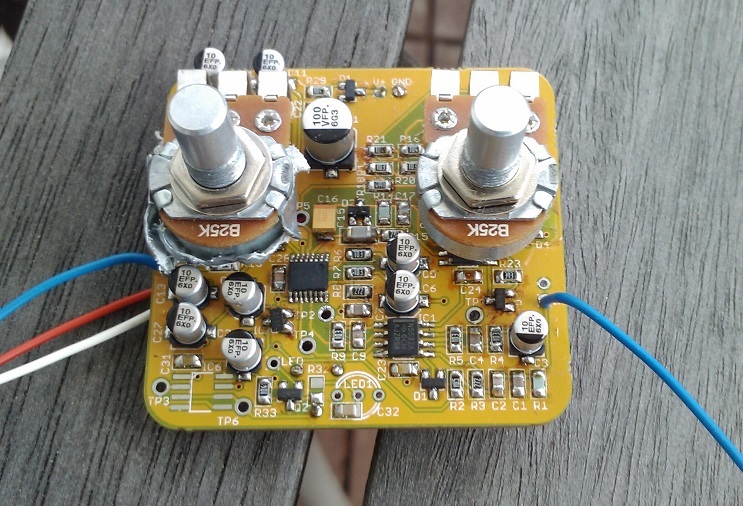 This is a preview of a Battery-Powered One Knob Squeezer Guitar Compressor using the new THAT4316 low-voltage, low current Analog Engine®. The whole gizmo is powered from a single 9V battery and pulls about 5 mA. To my ear the NLC was better particularly on Bass. I did some LF FFTs with 1u and 2u2 in the NLC and the 2u2 seemed better all-around. I'm not a guitar player though but several people at THAT are and they seemed to like the NLC's tuning. The NLC/No NLC area is ripe for experimentation. BTW I found the 4316 incredibly easy to use. 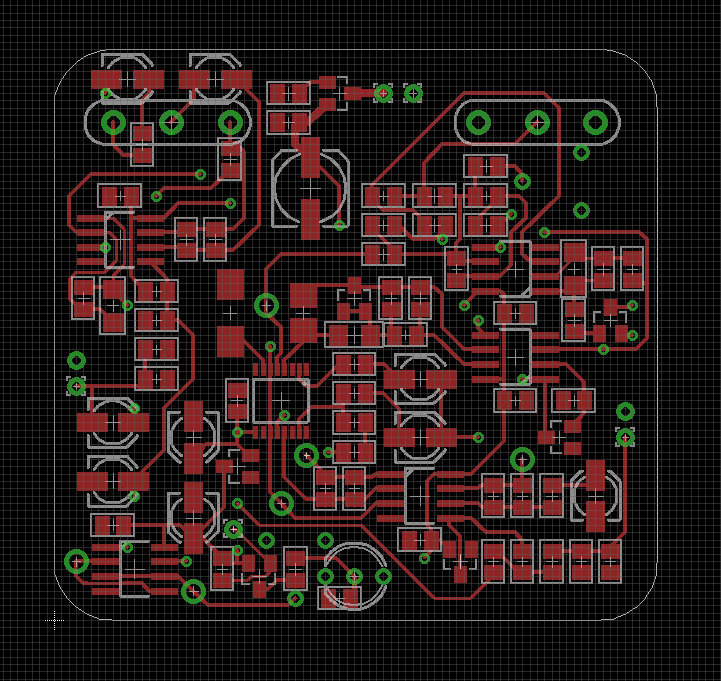 It doesn't get much simpler and I was surprised at the level of performance for a 5V (or less) single-supply part. The SMT-DIP adapters THAT sell for these and their other SMT parts make prototyping easy. I have to say that the THAT4316 is an extremely easy part to apply. The VCA is amazing for such a low-voltage part. Nice job... a "clean" guitar compressor may be moving a little in the wrong direction for lead guitar, but clean compression should be appreciated by bass players. That part would be sweet to make a compander for say a battery powered wireless microphone where the good battery life would be nice, or in an analog chorus/delay guitar pedal, also battery powered. SMD is inevitable....resistance is futile (and very tiny). I have a dirty compressor but it's top secret. THAT have some pretty good Compander designs for wireless apps in the datasheet. Even with a fully DSP-based mic it would seem to have a niche to prevent mic A/D overload as a protection limiter. Another potential configuration is a analog encode/DSP decode wireless compander that would reduce MIPS, latency and power on the encode side. On the decode side you've got power to burn but on encode low power is still critical. In ear monitoring is another good battery-powered decode application. In ear requires very low latency. I too had thought about it for BBD delay/chorus to replace NE570 designs. One thing I should point out to anyone contemplating the use of the 4316 is that, with the exception of the RMS detector output it is current in/current out. A bit concerned that it's a 5V chip. Probably because 5v is more than sufficient for its stated purposes, none of which are guitar pickups. The supply voltage of 5V (max) of the 4316 doesn't limit it's overload capability to <5V because the VCA inputs/outputs and RMS detector input are currents, not voltages. The resistors which convert the input and output currents to voltages can be scaled for use at elevated levels which exceed the 5V supply of the part. The RMS detector output is not constrained by supply voltage since it scales at ~6mV/dB or ~120mV/20dB around a mid-supply value of +2.5V. With input/output resistors scaled properly and a supply voltage to support the final output stage I-V converter's signal swing, the part can be used at pro levels of +21 dBu or more. Yup their (current ratioing) VCAs are current-in current-out devices too, as long as they don't support voltage output with built in opamps. 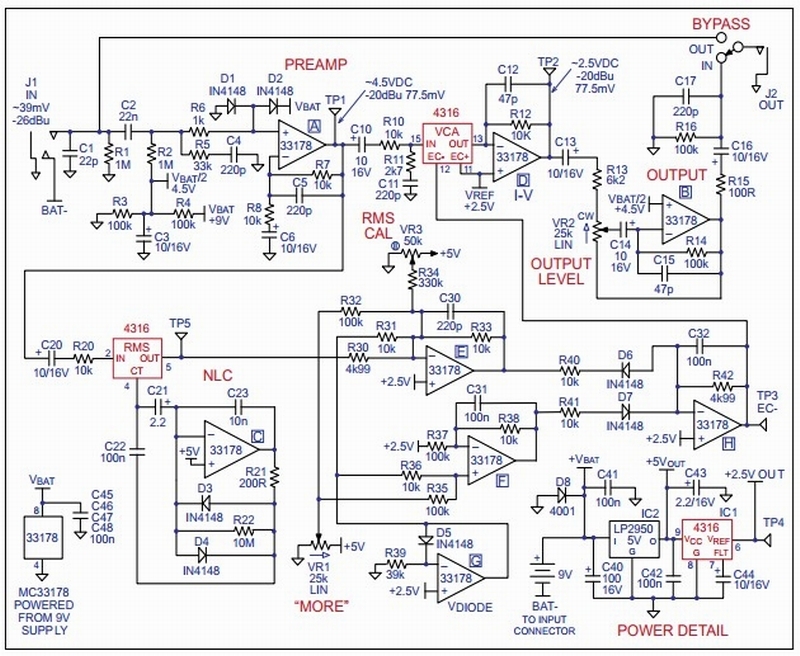 I have run into process/voltage limitations with some modern analog or mixed technology ICs. A sweet (TI) class D chip I use to drive the speakers in my battery powered drum tuner, that sips current, can not tolerate the full unloaded voltage from 4x AA cells when fresh (1.65V ea). I had to add a little pre-regulator. Perhaps in a future generation I will just use rechargeable AA cells that are only 1.3V or so when charged, or only 3x AA cells. Nice work. How do you get FFT ?